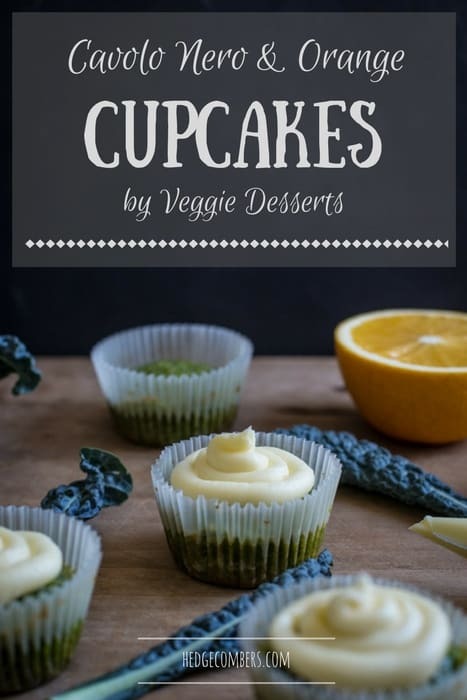 These Cavolo Nero and Orange Cupcakes from Veggie Desserts squeeze in a smidge of dark green leafy goodness into an otherwise decadent sweet treat. First up, before we let you any where near the recipe for these scrummy cavolo nero and orange cupcakes, check out this gorgeous lady. This is Katherine, aka Veggie Desserts. She is the author of one of my favourite food blogs, Veggie Desserts, and creator of my most favourite vegan chocolate cake ever. She also happens to be one of my closest blogging friends. Today is a massive day in her career as she launches her first ever cookbook! Squeeee! As the title of her blog suggests, she is the queen of sneaking vegetables into cakes, puddings and other sweet treats. Before you turn your nose up at the idea, think about carrot cake. Isn’t that one of the most flavourful, moist and delicious cakes on the planet? So wouldn’t parsnip have the same effect, or even swede? That said, I will admit to being just a little dubious about putting a kale puree into a cupcake recipe! However (and I promise I’m not just saying this because she’s my friend) these cupcakes are really good. The cupcake itself is green (which causes a hilarious reaction in those they are offered to!). The flavour is sweet and citrusy from the orange juice and zest, and there is the slightest hint of a ‘green’ aftertaste. Although it’s that subtle that I’m not entirely sure as whether it’s imagined or not. You can grab your own copy of this awesome cookbook on Amazon today! Just click on the pic below, and come join the Veggie Desserts revolution! Preheat the oven to 170/150 fan/325/gas 3. Line a 12 cup muffin pan with paper cases. Chop the cavolo nero leaves into bite sized pieces and boil or steam for a few minutes until tender. Refresh by running under cold water, then drain and squeeze out any excess moisture. Chop finely. Puree it with a hand blender - it will be a bit stringy, but you want it to be as smooth a paste as possible to get the best colour. If necessary, add the orange juice to make it easier to puree, then set aside. In large bowl, cream the butter and sugar with an electric mixer until light and fluffy. Beat in the eggs, one at a time, and beating each one in well, then beat in the cavolo nero, vanilla, orange juice and zest. The batter may split but it will come together when the flour is added. Fill the muffin cups three-quarters full with the batter and bake for 20 minutes, or until a skewer inserted in the middle comes out clean. Leave to cool in the pan for 10 minutes, then turn out onto a wire rack and leave to cool completely. In a large bowl, cream the butter and sugar with an electric mixer until fluffy, then add the icing sugar and beat until thick. Add enough of the orange juice to make it a frosting consistency - you may not need all of it. Store in the fridge until ready to use. Spoon into a piping bag and pipe over the cooled cupcakes. I am SO intrigued to try these, you did a wonderful job baking them ! These look gorgeous, and on my list to try. I did the lovely pea and mint cupcakes with rosewater buttercream, also wonderful. Such a fabulous book, isn’t it? Great minds think alike. It had to be kale ;) I know know Kale goes well with apple so I’m sure it does with orange as well. Have you got any left? Perhaps I could pop along ….